PREMIUM QUALITY Jasmine OIL: 100% Pure, Natural, Therapeutic Grade. Premium Quality. Non-Toxin, No Additives, No Fillers, Unfiltered and Undiluted. Vegan certified, paraben free and cruelty free. 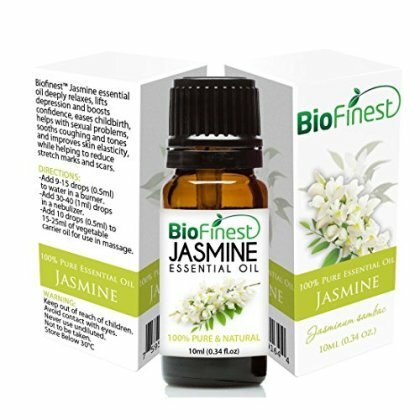 AMAZING AROMATHERAPY EXPEIRENCE- Add a few drops of Biofinest Jasmine Oil into your oil diffuser to inhale the ultimate serenity while refreshing the room with the crisp scent of Jasmine Oil. This spectacular scent will also open your airway and fill you with an invigorating fresh, renewed feeling. EXHANCE SELF CONFIDENCE AND ROMANCE: Jasmine has a warm, exotic, floral fragrance that relaxes, soothes, uplifts, and enhances self-confidence. Jasmine is beneficial for the skin. It has been used throughout history for romance and attraction and for balancing the feminine energy of the body, Relieves menstrual problems and labor pain.